I once received a new member welcome email that was so drab, it caused me to cancel my membership with the association. Well... there's a little more to the story than that, let me explain. At first glance, this email seems to have all the important details, but it’s missing something big. When I joined, I expected the association to be excited to meet me. I expected them to reach out and connect me with other members. Plus, I was looking for some positive reinforcement, since I’d just forked out my money to join. Unfortunately, this email looks like it was written by a robot. My excitement and impression of the association dropped to zero. A few days later, a friend recommended another association in the same industry. I ended up joining and immediately received a wonderful welcome email. It was personally written from the admin. She asked if I had any questions and included a short tour of the website. She also followed up the same day with an invite to the association’s next networking event. That experience was so positive, I cancelled my membership with the first association (there wasn't any need to be part of two similar organizations) and haven’t considered them since. If you think your new member welcome email could use some improvement, I’m going to show you nine things I’ve seen membership organizations do to create a positive first impression. 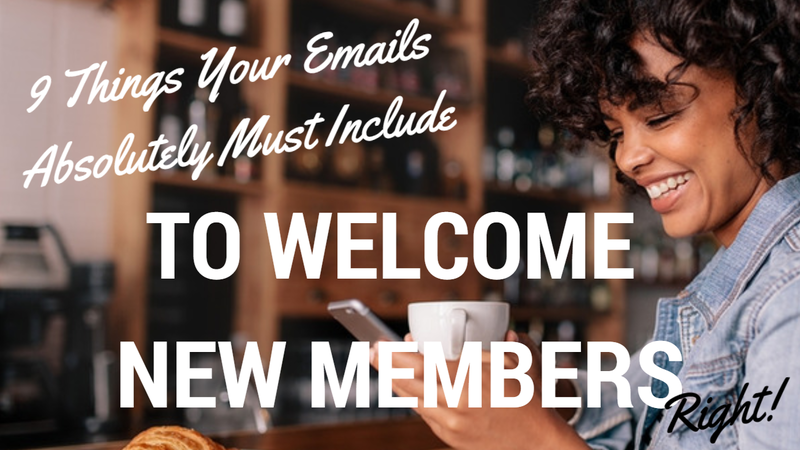 I’ll also include examples of some amazing welcome emails I’ve seen, the best way to automate your emails to welcome new members, and a template for you to use at the end. First things first, it’s a common best practice to personalize your email’s subject line. Studies show that doing this can increase your email’s open rate by 26%. To do this, simply include a real person’s name in the “Sender Name” field of your email, instead of your organization’s. Or, include both like I’ve done below. Recipients see “Terry from Wild Apricot” when they get an email from me. What I commonly hear after an organization does this is that new members start emailing them back, thanking the specific person in the email for accepting their membership — something that didn’t typically happen before. Another best practice is to include a clear confirmation message of their membership in the subject line — often members will refer back to this email to dig up their account details, so it needs to be recognizable if they search for it. EXAMPLE: Hi [NAME], welcome to [ORGANIZATION]! Here are your membership details. One final thing to mention: do not make this email a “noreply” email. Here’s why. A noreply email sets the precedent that your organization is difficult to get in touch with — the opposite impression you want to make. You know that gut feeling you get when you regret a choice? If it happens after you purchase something, it’s called Buyer’s Remorse and it’s the last thing you want your new members to feel. It’s very hard to form a positive impression after someone feels Buyer’s Remorse — this is actually what I was feeling before I cancelled my membership. Fortunately, there are some easy ways to combat Buyer’s Remorse and actually make new members feel confident they made the right choice. For example, you can incorporate an element of Social Proof — the theory that people will like and do things they see other people doing. Social proof is one of the six principles of persuasion identified by famous psychologist Robert Cialdini. If 1,000 other people are finding value in a membership, it must be a good decision to join. I recommend starting your new member email off with a statement like this to create a positive sentiment from the bat. Many organizations assume new members have done their research about the organization. In reality, many have not. That’s why it’s important to share some background info about who you are in your welcome email. Include your mission statement and the reason your organization exists. This allows the new member to see if their personal values match your organization’s. Include actions your organization takes throughout the year to let your new member know how to get involved. Include any other info critical for new members to know. newchoir is Toronto's first rock choir. It was founded in 2005 as an enthusiastic community choir of people with a common desire to sing rock. Now, an auditioned choir collaborating with high-caliber Canadian artists, and performing with a live band, we present sold-out concerts each season at world class venues including Koerner Hall (Toronto) and Carnegie Hall (NYC). Throughout the season, we do gigs, flashmobs, and charitable appearances at landmark venues including Casa Loma, Harbourfront, Pearson Airport, Art Gallery of Ontario and Dundas Square. Restating member benefits in the welcome email can help someone justify the money they just spent on your membership. If you have several membership levels, you’ll need to customize each of your welcome messages, so every member gets a summary of the benefits of their particular level. If you promised the new member something as soon as they signed up (like a cheat sheet, report, or login access to your membership site), give them quick, easy access to those bonuses in your welcome message. You can also give them access to other online resources, like helpful blog posts, your member directory, or your event calendar. You don’t want to put any roadblocks in front of your new members when they want to access these resources, so make sure to test this process carefully. Test all hyperlinks before you start sending the email, and if the new member is downloading something, make sure the download process is frictionless and hassle-free. 6) A Clear Description of What Will Happen Next. Just as I was expecting the association to show me around, so are your new members. That’s why it’s important to let your newest members know what’s going to happen next, so they don’t feel like you’ve left them hanging. An introduction to their support person or instructor. If more than one thing happens next, take the time to explain each thing. You don’t need to be clever or cute in this section of your email welcome message – clarity is the most important thing for your new members. Remember, you’re making your first impression with your welcome message. Show a little personality by telling a quick story, talking about how your organization is different from your competition, or addressing a problem in a unique way. When you’ve said everything you need to say, wrap up your email and sign off. In your sign-off, use a tone that matches the rest of your message (warm and friendly, formal and corporate, etc.) and try leave your new member on a positive note. If possible, include a signature from a real person, not a company. Like I said before, many people will personally respond to the name you sign off with in your email. It’s this extra touch that can make your organization seem more personable. Just like I was, many new members may be excited to connect personally with someone at your organization. The answers from your new members give you useful (and free) market research, too. If you’re going to add a question to your welcome email, decide in advance whether you’re going to respond personally to every reply you get. Some organizations get members pouring out their private thoughts to you in their responses – so be prepared. It’s possible to automate every new member welcome email without coming across as a robot. In fact this is what I recommend organizations do, because it’s simply too much work for an admin to write a customized email for every new member that joins. The trick is to write your email in a way that can apply to anyone and then use software that can customize the personal information (such as someone's name) for each different email. One software that can do this is Wild Apricot (that's us!). It does this by connecting your contact database with its email system to create personal, yet automated messages for each contact. Wild Apricot is the #1 rated membership management software used by nearly 20,000 organization across the United States. You can try a free, 30-day trial of Wild Apricot and have your organization setup with a professional-looking website that can easily register new members online and send them automated (and customizable) email messages. Instantly process online payments, fees, and donations. Setup online event registration pages, payments, and reminders. Improve member communication through automated invoices, emails, and newsletters. Create a professional, easy to build website where you can host a news section, notices, resources, member directory, an event calendar and more. Maintain a full contact database that's easy to search, filter, and update. Create financial reports, analytics, and membership summaries in seconds. Save your organization money and time by automating many more administrative tasks. If you’d like to save hours every week from automating your administrative tasks, start your free, 30-day trial of Wild Apricot now. Here’s a simple template you can use to create a new member welcome email that leaves a good impression. 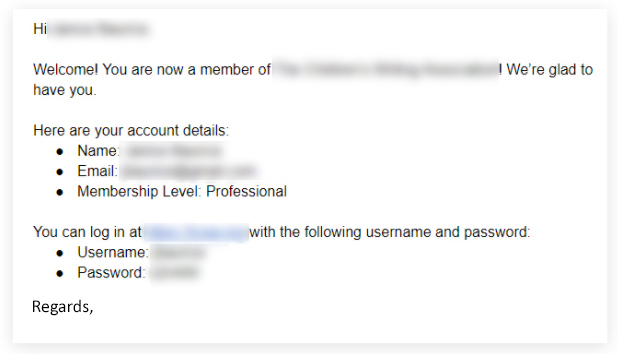 Subject Line: Welcome, [NAME}, you’re now a member of [ORGANIZATION]! Here are 3 things to expect next. Welcome, and thank you for becoming a member of [ORGANIZATION]! I’m so happy you joined our network of over [number] professionals in the city. What is the #1 reason you joined? If you could respond to this email with your answer, it would help me create a great experience for you and direct you to the right place. In the meantime, if you’d like to get started accessing some of our exclusive resources, visit our members-only area here [LINK]. If you have any questions at all, I’d love to hear from you. Simply reply back to this email, or give me a call at 999-9999. Best of success and I hope to see you at our next event! It's my hope that by using this template and following these tips, that you can create a positive first impression with every new member.